Some open access publications ask authors to pay article processing charges (APCs) to support making their articles readily available while moving away from subscriptions income. These fees allow journals to make their publications immediately and freely available online. Journals understand that APC fees can be a barrier for researchers without funding. Some journals will waive the charge for unfunded research, while researchers with grants may use those funds to pay for the APC fees. High-quality journals still have basic costs to publish to make open access articles free or low cost for researchers. Many faculty members at Portland State University are actively engaged with open access publishing. 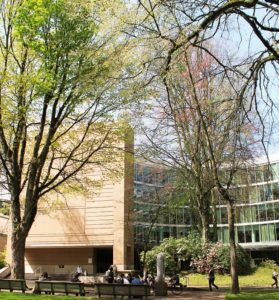 The PSU Library interviewed Daniel Ballhorn, Associate Professor of Biology at Portland State University, about why he values open access. You’re on the Editorial Board of several open access publications. Can you tell us why you decided to serve at these journals instead of commercially produced scholarly journals? What barriers do researchers/scholars face when it comes to publishing in open access publications? DB: [The] costs of publishing open access. Fees of several thousand dollars are common and cannot be afforded by many researchers either. While I understand that high costs are involved to run a successful open access journal the price for publishing is still a barrier. What advice do you have for students or new faculty members who are looking to publish their work open access? DB: Pick the right journal!!! There are many almost predatory open access journals out there. Their emails asking for manuscript submissions are spam-like. Publishing with such journals has little value or even may harm your career. How do you think PSU can best support students and faculty who are interested in OA? DB: I think information or workshops on where to publish – depending on the field of research – might be helpful. Financial contribution like a percentage of the publishing costs would be nice but probably is not feasible. I think assistance with picking the right journal is more important.